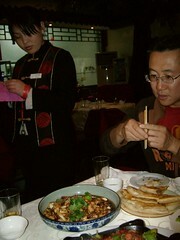 Bullfrog Stew was one of the more interesting dishes we sampled in Beijing. It was tasty – spicy stew with the bullfrog meat very soft and tender. The tiny bones, however, made it kind of hard to really savor. Pictured is Kevin Wu, my friend and Medford Oregon Dentist. This entry was posted in Beijing, medford dentist, not yet categorized, oregon and tagged Beijing, bullfrog stew, medford oregon dentist. Bookmark the permalink. Sabroso! I wager there are other Duck-fans who await the….you know………pics of a tasty live-monkey brain stew, with the customized table. Hey, don’t spoil my appetite !